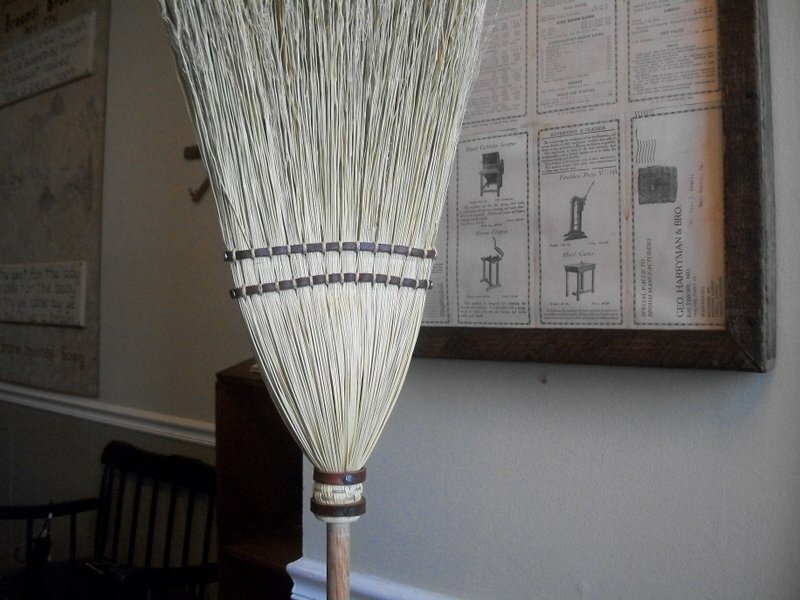 Thanks for visiting the Kick n' Stitch Online Broom Museum. Scroll down or use the menu to get started. 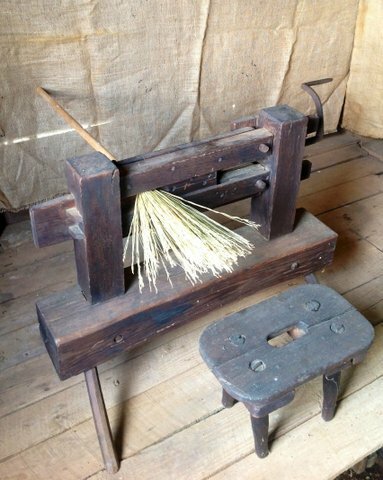 Throughout human history sweeping implements made from various natural fibers have been fashioned and used. 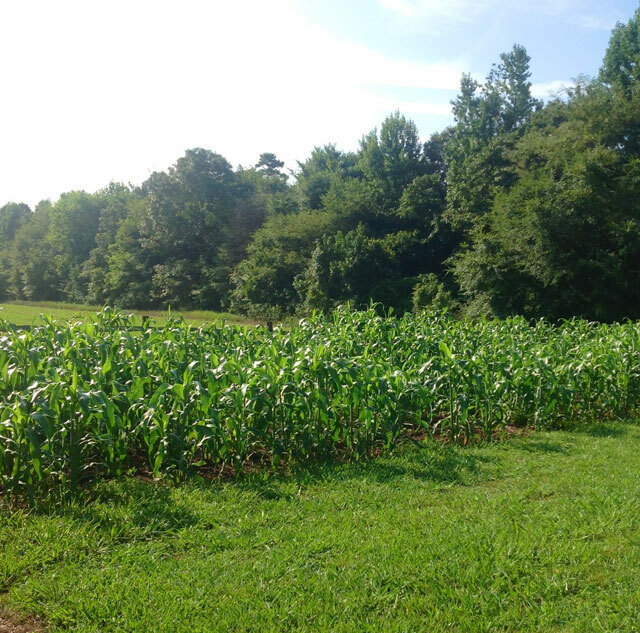 One of these is Broomcorn Sorghum. Certain history uncovered records that it originated in Africa. 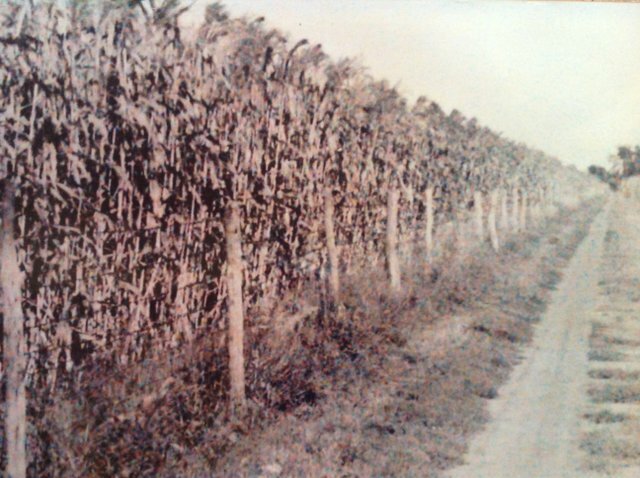 Likely introduced from Europe, broomcorn was in America at the latest by the mid eighteenth century as evidenced by a letter sent by Benjamin Franklin from Philadelphia on March 24th, 1757 to Rhode Island statesman Samuel Ward, which in part read "I enclose you some of the grain called Whisk Corn, or Broom Corn. 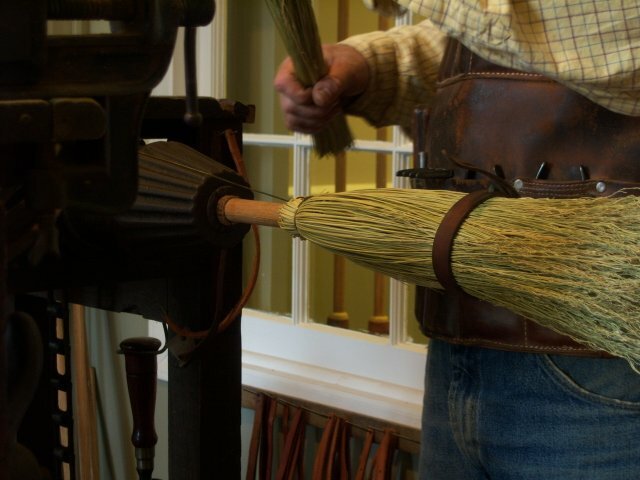 - - - they make the Whisk Brushes for Velvet and excellent Brooms." 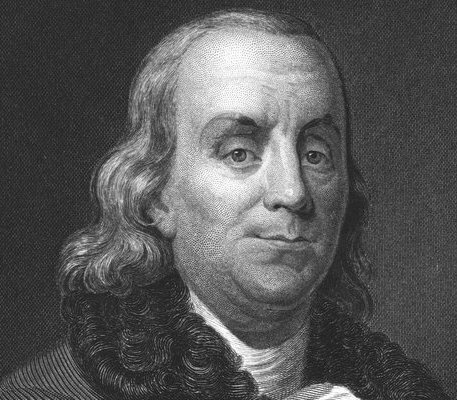 So, whether "the" initiator, as some accounts suggest, or not, promoted by the eminent Dr. Franklin, as well as by those following in his wake, interest in this useful plant slowly took root. 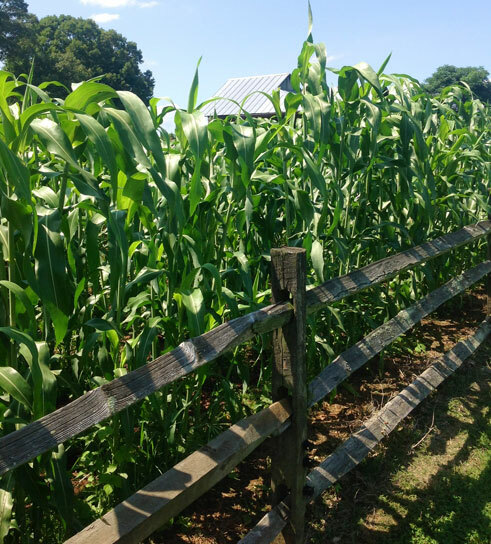 Broomcorn began to be spottily grown and used on a domestic level in the upper mid-Atlantic and lower New England states, based on farm journal and account book entries, and experienced a gradual increase throughout the balance of the century. Its commercial production evidently started in 1797 at a cottage industry level in the region of the Connecticut River Valley near Hadley, Massachusetts, and increased quite rapidly over the subsequent years. 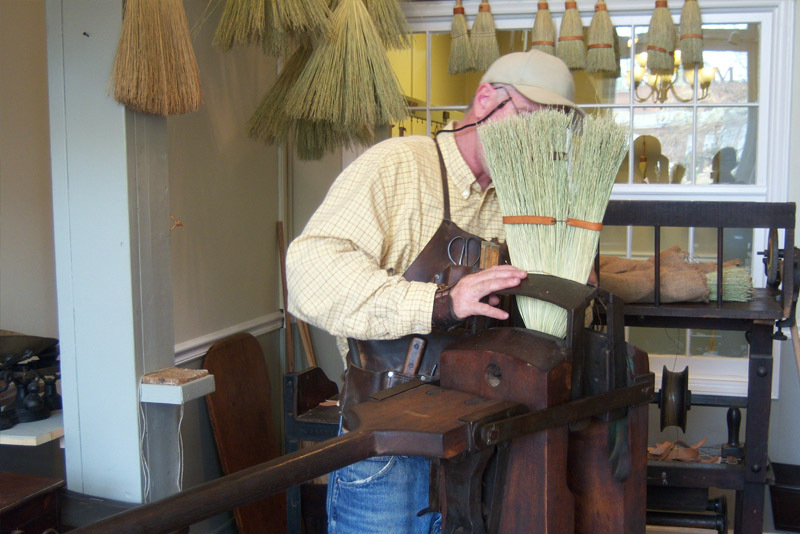 The American broom industry had begun. 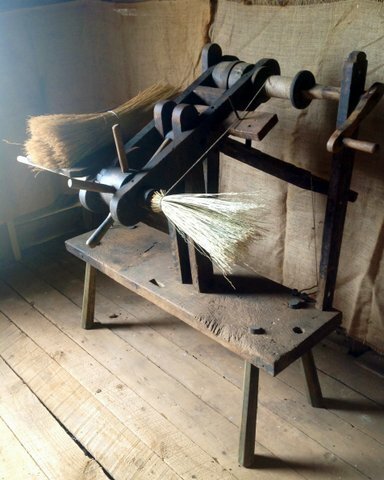 The Shakers, commonly associated with furniture building, were heavily engaged in broom production as well (brooms being one of their signature products), and have an important connection to the brooms we are familar with today. 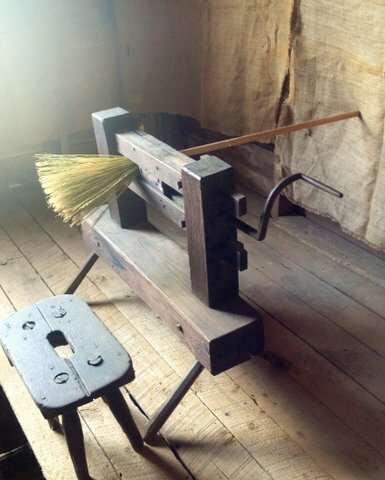 Known for their industriousness and innovativeness, one Shaker member by the name of Theodore Bates is credited with inventing the broom press used for flattening a round broom. Round brooms, common at this time, did not cover as much floor space, while sweeping, as a flat broom. 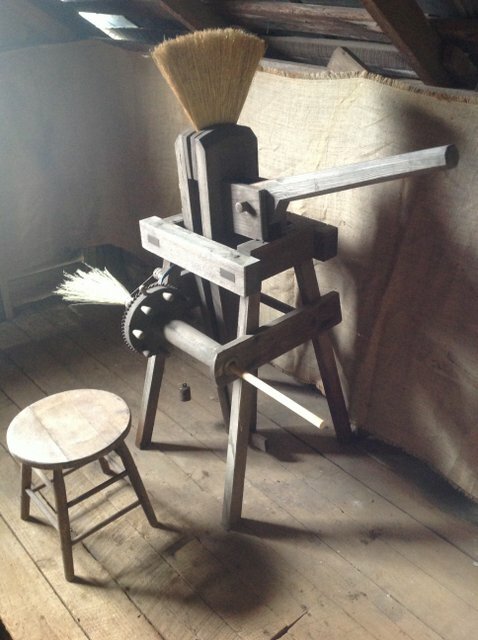 Flat brooms brought about greater sweeping efficiency, and efficiency was of great importance to the Shakers. 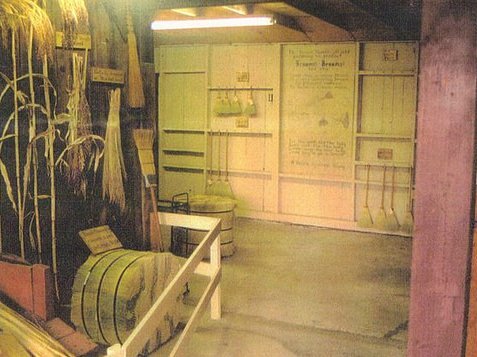 Growing broomcorn as a garden ornamental and for domestic broom-making for nearly twenty years prior, the community at Watervliet, NY was the first among the Shakers to manufacture brooms in 1798, with the community at Mt. Lebanon, NY being in full swing at least by 1805. 1. 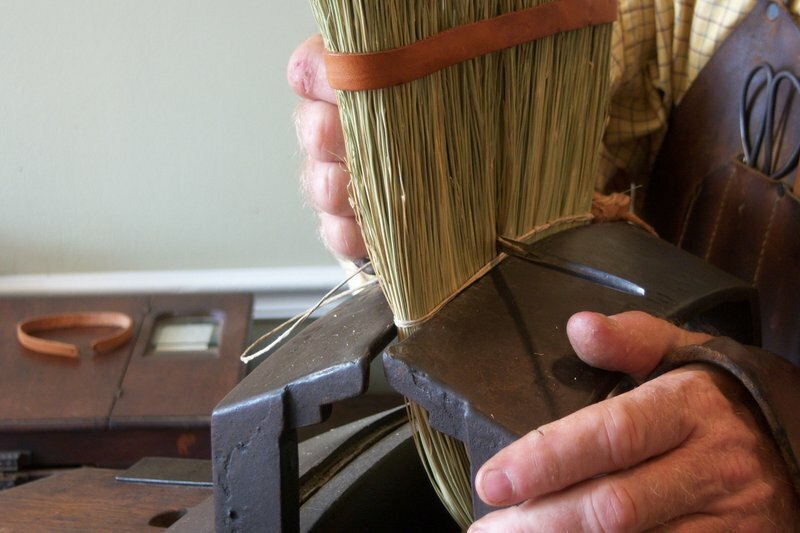 Attaching the broomcorn to the handle; the binding process. 2. Securing the broom shape. 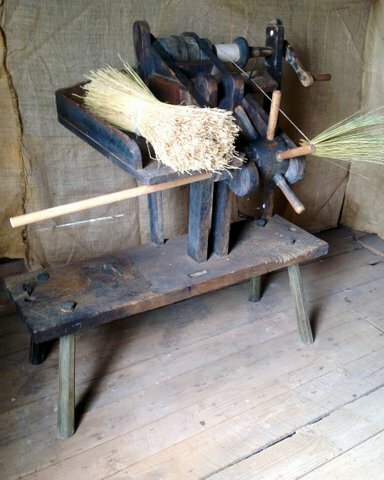 First, the broomcorn is attached to the handle with wire using a machine called a winder. 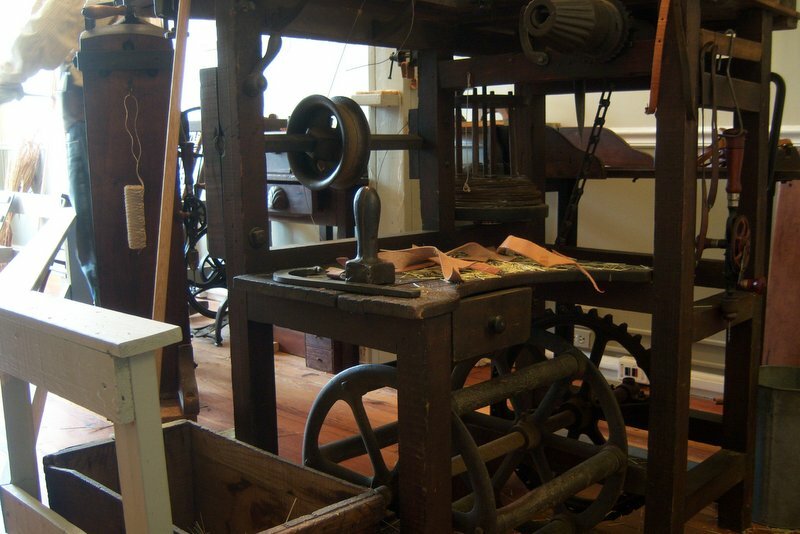 The winder used at this shop is a foot treadle machine, which is referred to by those in the business as a kicker. 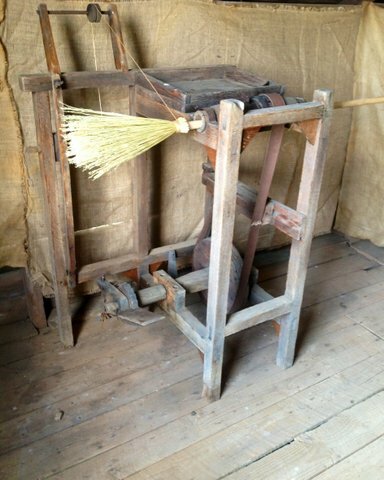 Second, the broom is temporarily mashed flat in a broom press and the shape is retained by a stitching process using twine. 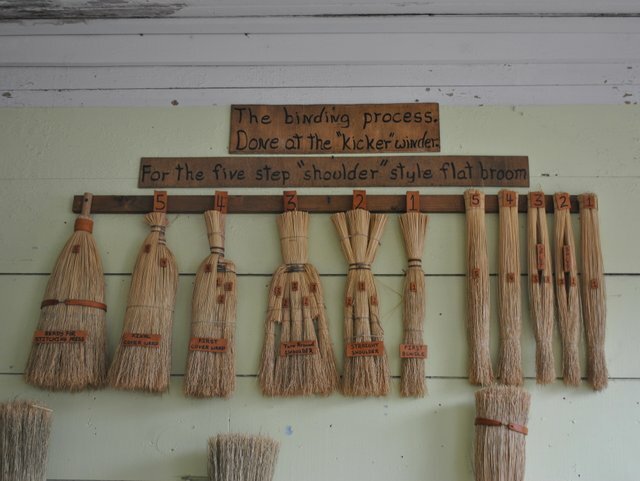 Therefore, "kicking" and stitching are the key elements to the process; hence The Kick n' Stitch Broom Shop. 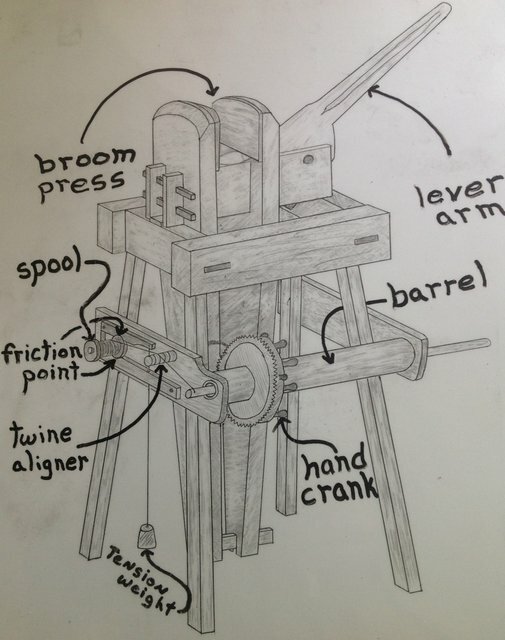 What are the mechanics of a broom winder and a broom press? 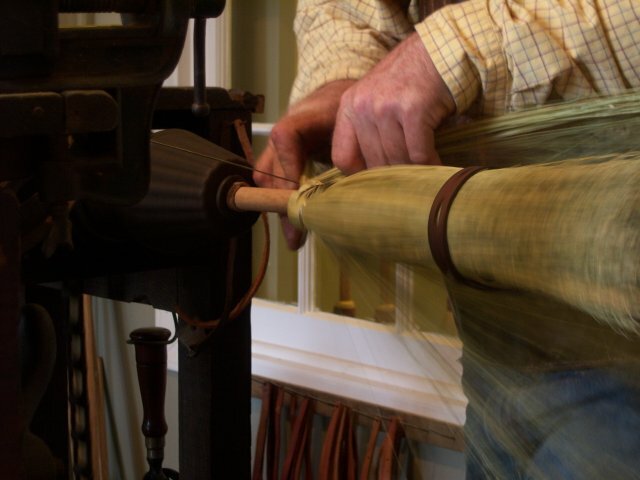 A spool is a dispenser for the binding material, whether wire or twine, which allows the material to "feed" out as needed. 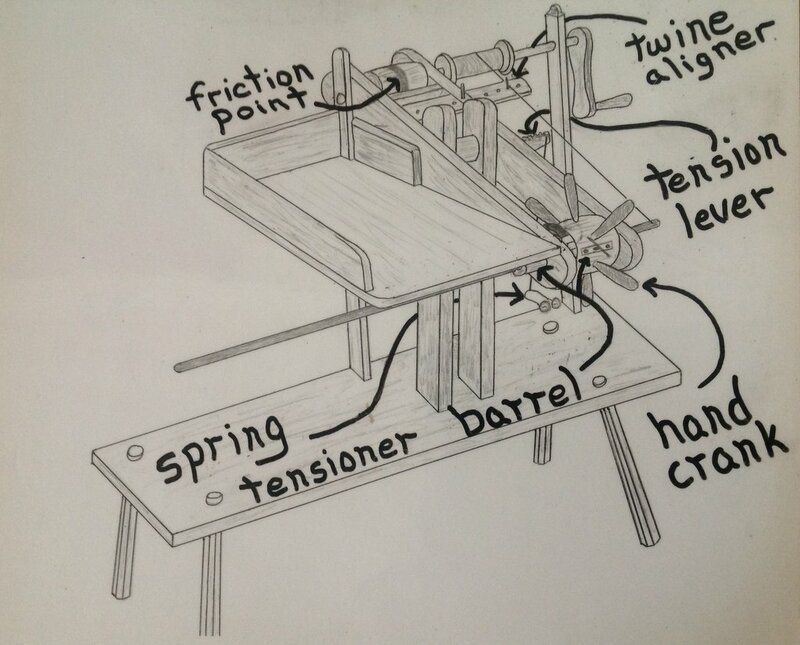 A tensioner is a way of causing the binding material to be under tension, assuring the secure and tight attachment of the broomcorn to the handle. A barrel and chuck is a hollow tub, metal or wood, with a securing mechanism at one end, used for holding the handle firmly while allowing it to rotate. 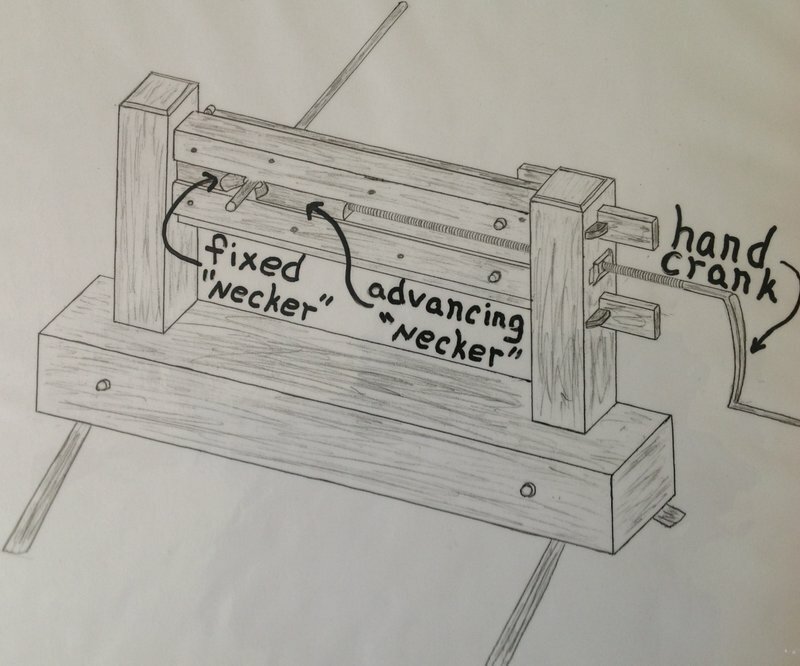 A handle-turning mechanism is a way of causing the handle to turn, either by hand or foot. The foot powered unit is referred to as a "kicker-winder". A binding aligner is a mechanism for adjusting the feed out position of the binding material. 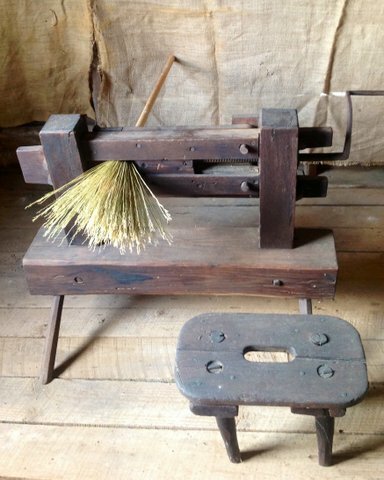 Possibly more descriptively, or accurately, referred to as Apparatuses, Contraptions, Gadgets or Contrivances, the following machines were used to attach the broomcorn to the handle, each using twine as the binding material. All but one, the first, are Winders. The dates given are educated guesses, not definitive. 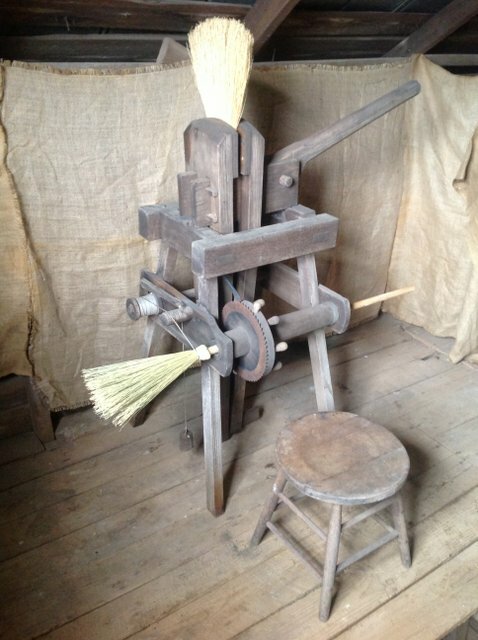 Of the Heritage Trades, broom making seems to have had the most varied configurations of machinery, but all still having the same basic components. 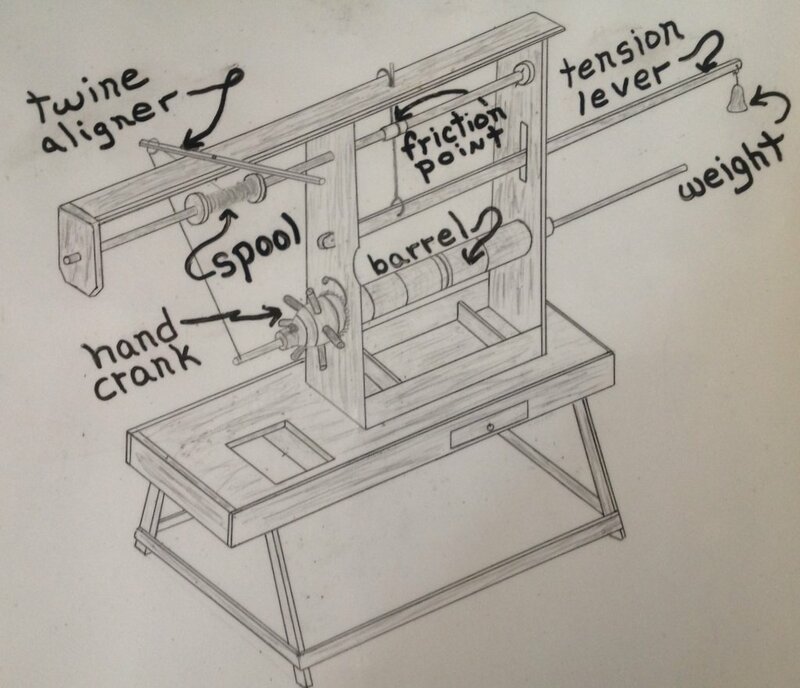 For those who are intrigued with mechanics, these are certainly an interesting study, as is the craftsmanship of the wood working, as each in made almost entirely of wood, with only a very few metal parts used. 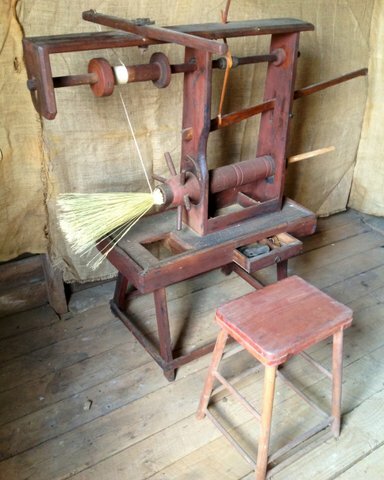 This machine was operated by turning the hand crank which advanced a necking component, which in turn squeezed the broomcorn around the handle, then secured with twine. 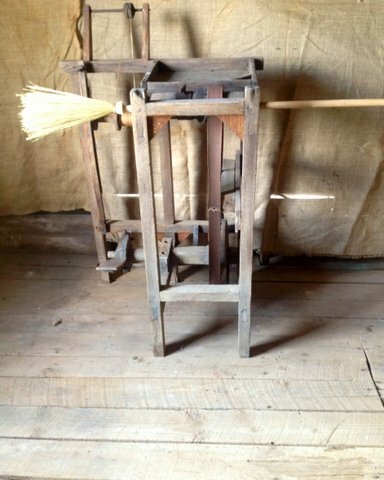 This winder was purchased from a ninety year old Maryland gentleman whose great-grandfather, a broom maker, used it in his shop. 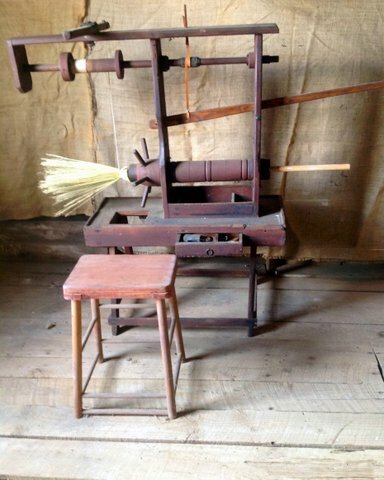 This fact would certainly set this machine back to the early 1800's. 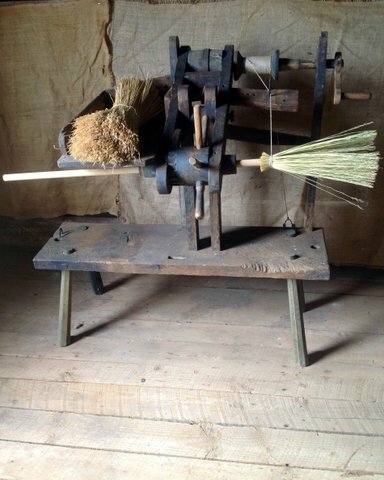 This machine combined the two main broom making processes; attaching the broomcorn and stitching it flat. 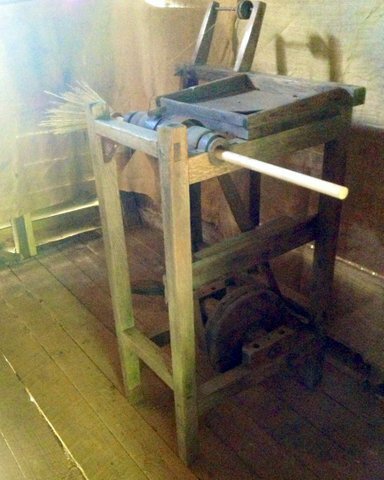 This winder was a bit more user friendly due to the tray for laying the broomcorn. 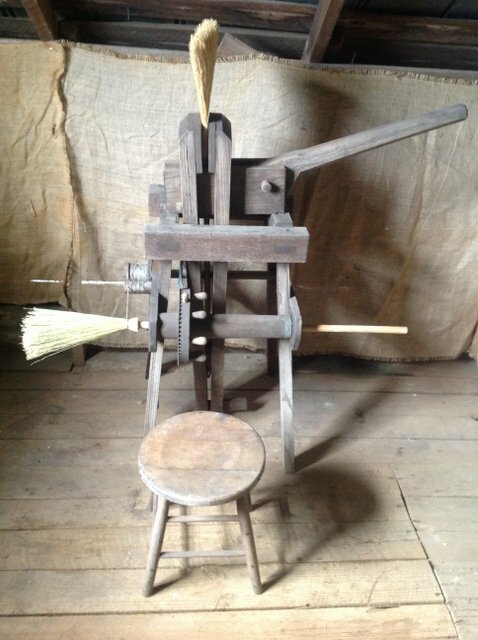 Its design also put the broom maker in a standing position during operations, possibly leading to the idea of a foot powered machine. 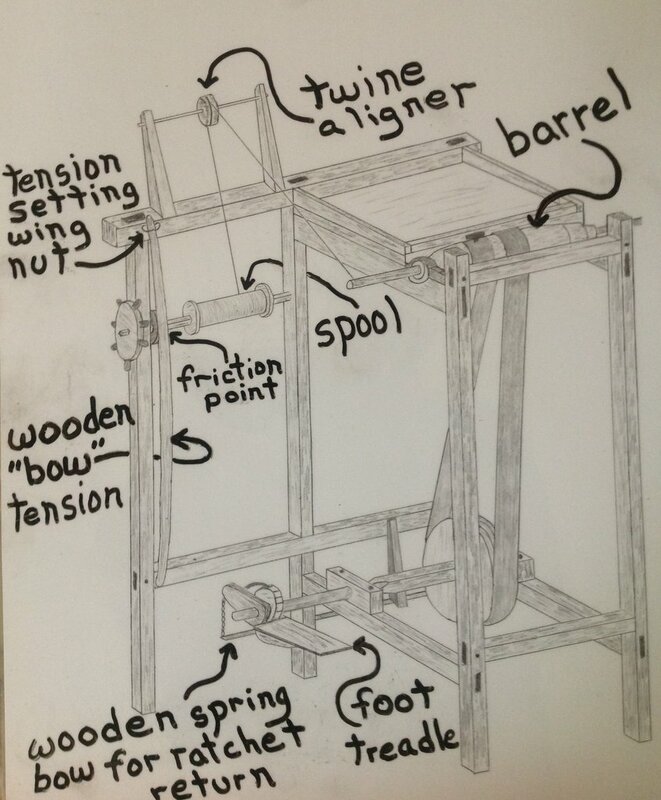 This winder offered a great advancement - foot activation. This freed up both hands to more affectively handle and work the broomcorn. The manner of operations in such a shop using this vintage technology can be described oxymoronically as Efficient Inefficiency. Along side "Industrial Age" technology and mass production, output is low; comparatively inefficient. However, when considered from the perspective of "work shop choreography" it is anything but. As with a variety of activities, or fields, requiring the art of designing sequences of movements, the regimen within the shop can be planned, perfected and executed with equally disciplined precision. Through experience of trial and error resulting in a honed, methodical system; along with the arrangement of tools and equipment in ways that almost eliminate wasted body movement, minimize process time, and maximize expended energy; the work activities smoothly, rhythmically moves along. Indeed, the sign of an accomplished trades person is the seemingly effortless way they execute their labors. 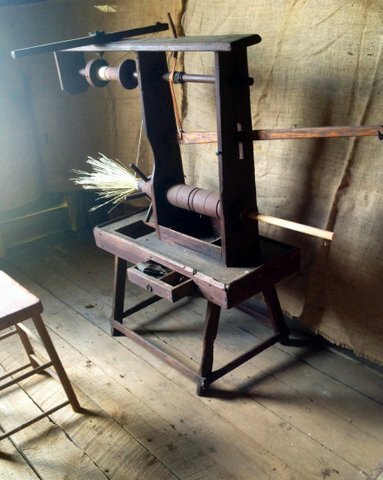 Likewise, with the use of this period equipment, and the relative slower pace of work it sets, comes the subtle sounds and cadence of the shop, facilitating maximum focus and attention to the details of the work. The movement of the tools are in exact synch with the mind. The mind, the body and the equipment, merge to accomplish the task, complimenting one another in the effort. With organization and order, all that makes up the tiny shop comes together, resulting in a relaxed, unhurried human efficiency. Using equipment that derives its power from a self reviving, perpetual combustion engine of sorts, the human body, it needs not a single watt of electricity to operate. The only electricity needed is what's required to furnish the engine, it's energy through a nutritious diet and a good nights rest. All the equipment used, being body powered, doesn't replace the broom maker, but gives valuable assitance instead. It brings about maximum mental and physical satisfaction upon use, and gratification with the product made. The result of the true craftsman's attitude toward the task at hand, that of the perfecting of utility and the designing of forms pure and refined embraces integrity, grace and rule in an elevated and clear sentiment which may be called the honor of labor. It is a subtle and unmistakable touch of caring and pride, an inspiration which gives to such work that finish which is almost art - which is art. 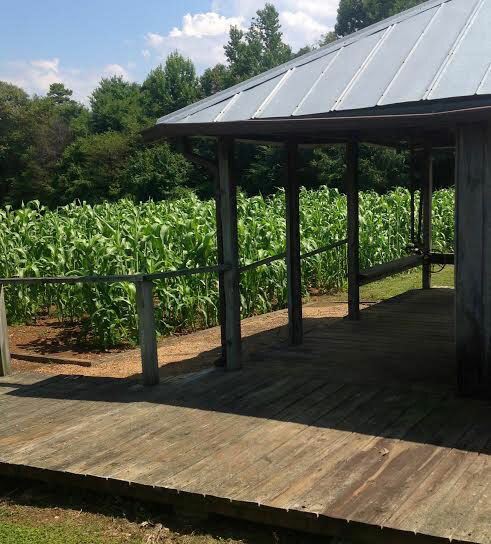 Besides their contribution to society through their inventions and innovations, the Shakers left something of equal or greater importance for future generations to learn from. This is the spirit at which they approached work. They aspired to doing the very best at their labors, their sight set on perfection. What followed was elevated workmanship and products that far exceeded the norm, becoming standards of quality. Their example serves as an inspiration today. There are two powerful influences at work in the minds of people. First the imperative need for self expression in some form of creative work and second, a desire for a greater connection with the things we own and use. 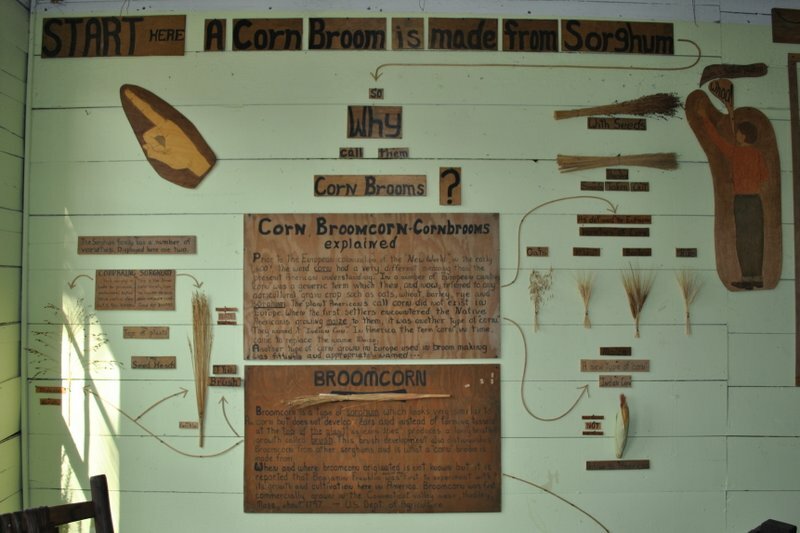 Corn brooms are made from a variety of sorghum called broomcorn. 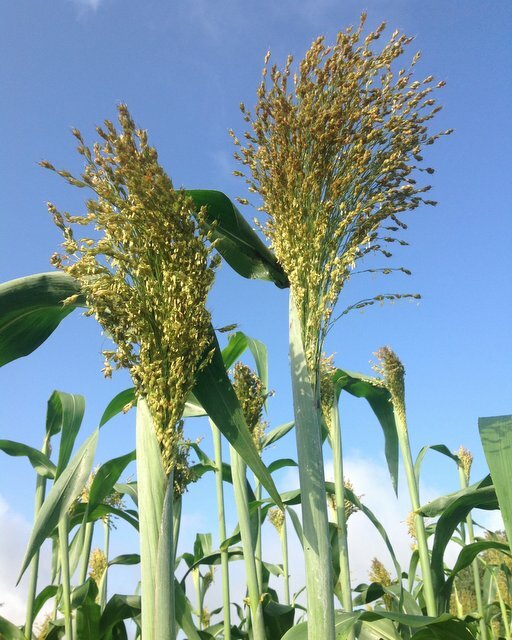 At the top of the mature plant, which can reach more than twelve feet in height, is the seed head of the broomcorn plant. The seed head is made up of a cluster of long, generally uniform stems or "panicle branches" called the brush. 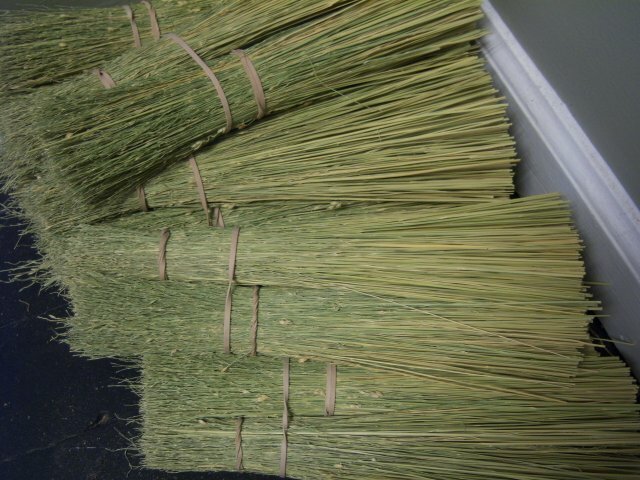 The brush is normally about twelve to twenty four inches long, covered with small seeds. 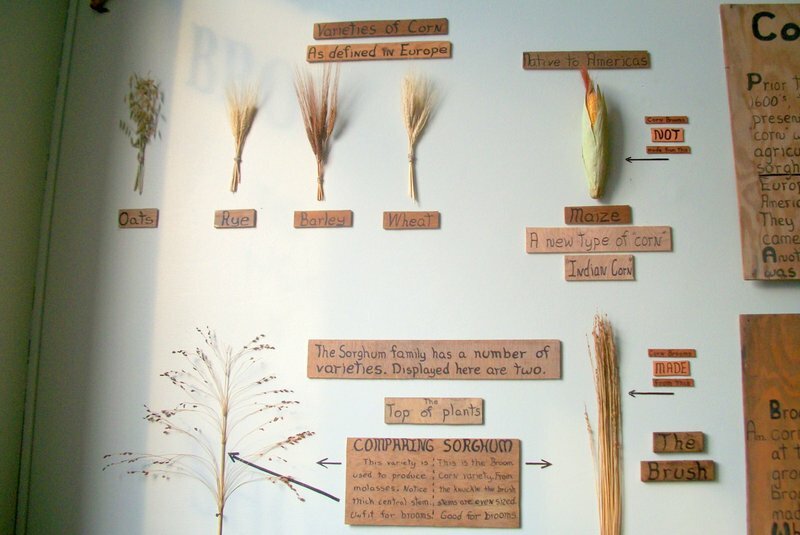 The seed head of the sorghum, once the seeds are removed, is used for broom making. 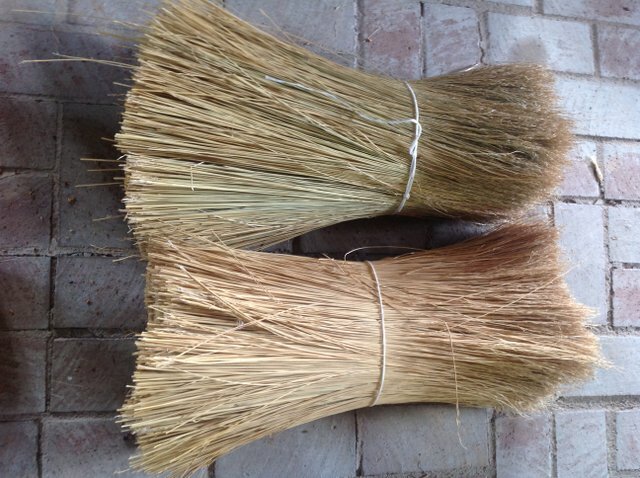 Why are they called "corn" brooms? 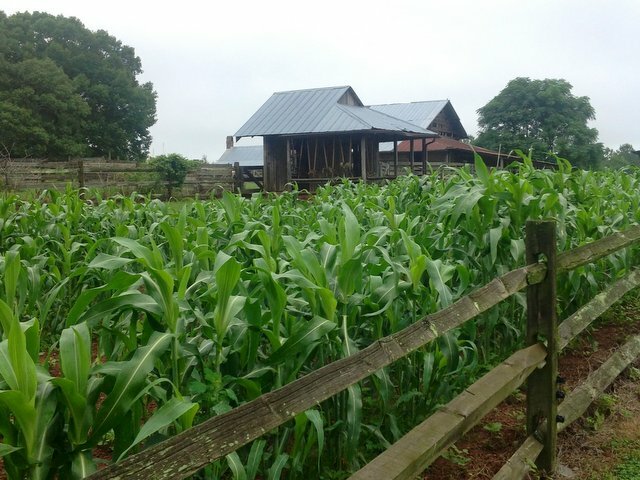 Prior to the settlement of America in the early 1600s, in Europe, "corn" was a general term referring to small cereal grain crops such as wheat, barley, oats, rye and sorghum. 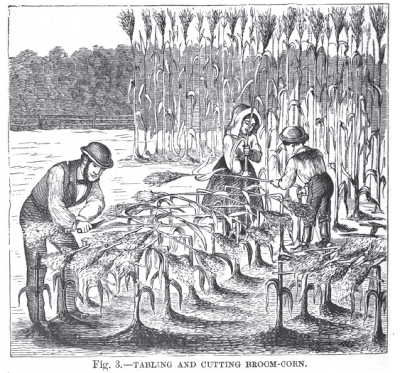 The brooms made with this variety of "corn" were called "cornbrooms". 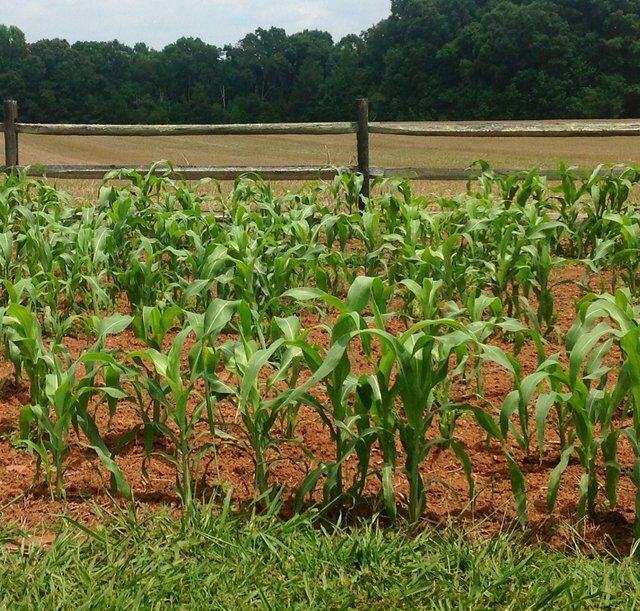 What do corn brooms have in common with American corn or "corn on the cob"? Only the name "corn." 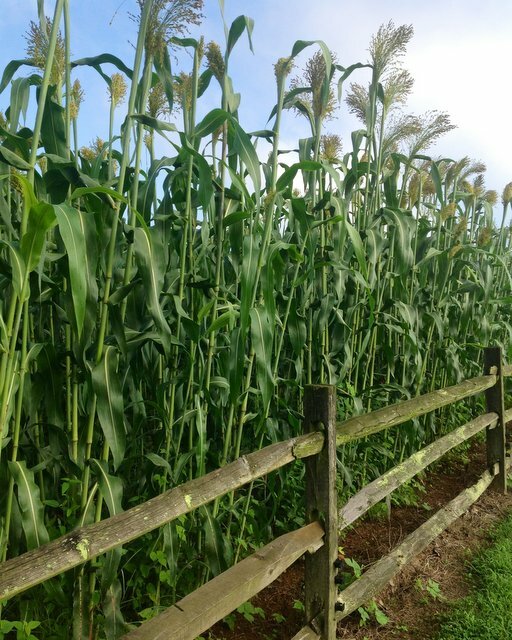 When the first European setllers arrived in the "New World" and saw the Native Americans growing maize, a plant they were unaccustomed to, they called this new type of corn "Indian Corn". 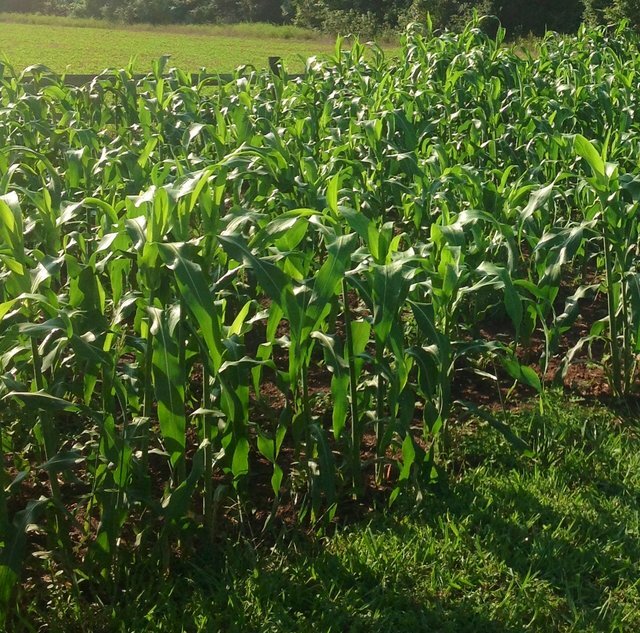 The term corn stuck, and over time became the name we use in America for maize. 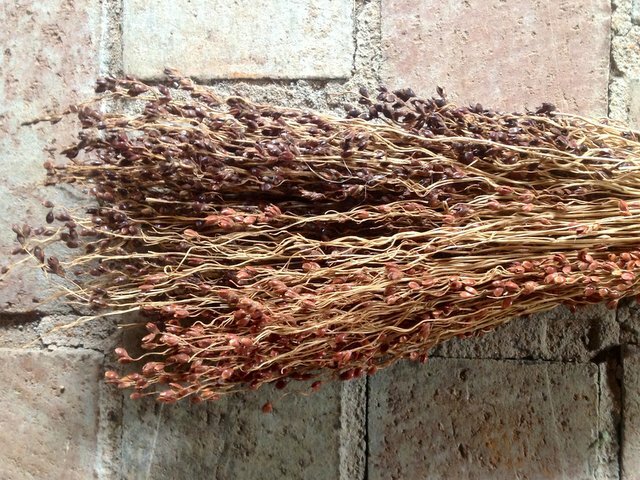 "I enclose you some of the Grain called Whisk Corn, or Broom Corn. 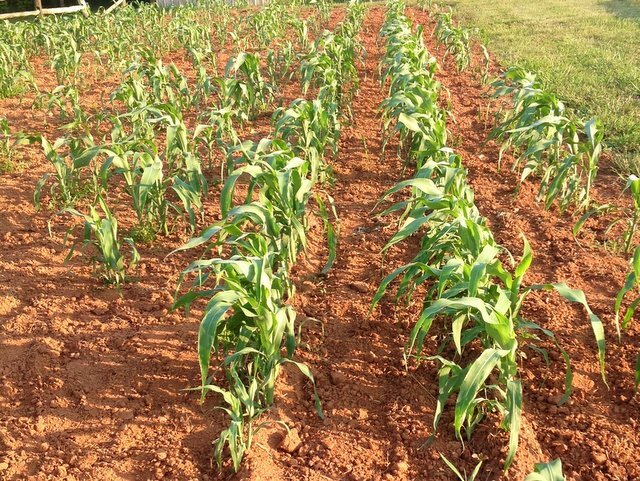 It must be planted in Hills like Indian Corn, 3 to 4 grains in a Hill. 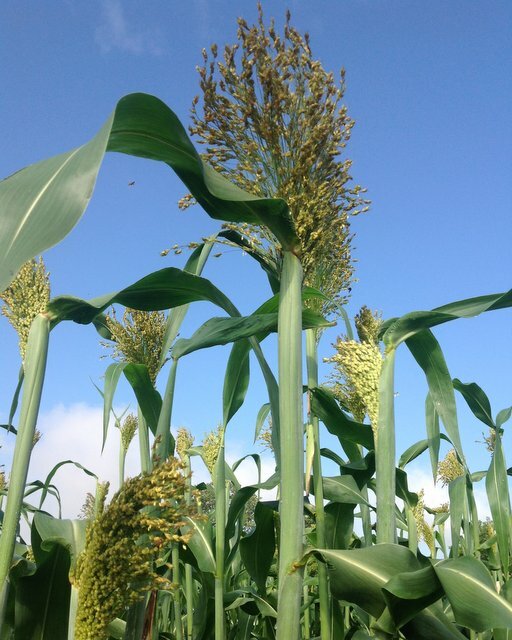 It looks like Indian Corn when growing, til the Top comes out, of which they make the Whisk Brushes for Velvet and excellent Brooms ... When tis ripe, gather it; you may strip the Seed off by Hand, from the Whisk, or your Fowls will pick it off ..."
Broomcorn as viewed in-line with the rows, or "with-row". 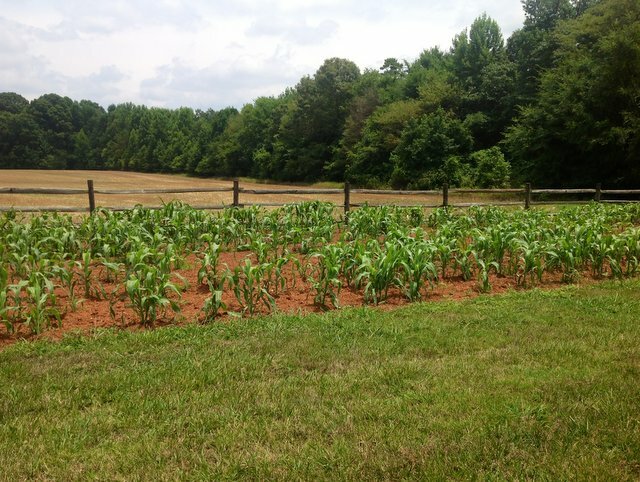 Use the split-rail fence as a growth gauge in the following pictures. Looking "cross-row". Plants "hilled" for the first of a couple of times. 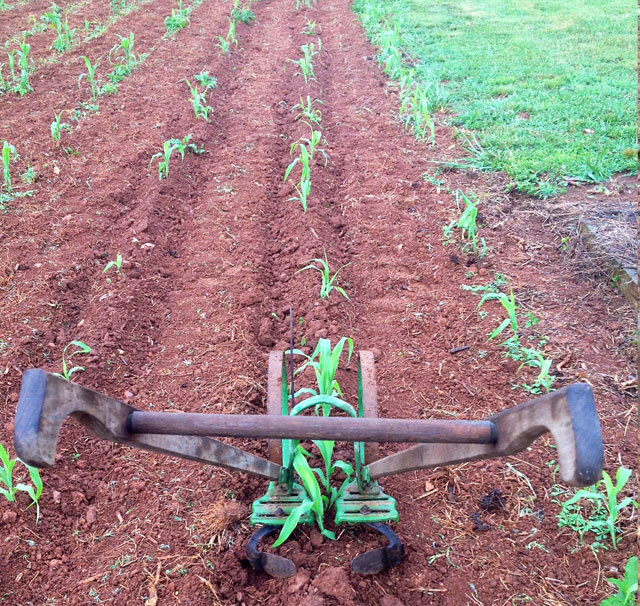 Using a two wheel push cultivator dirt is hilled in toward the plants. 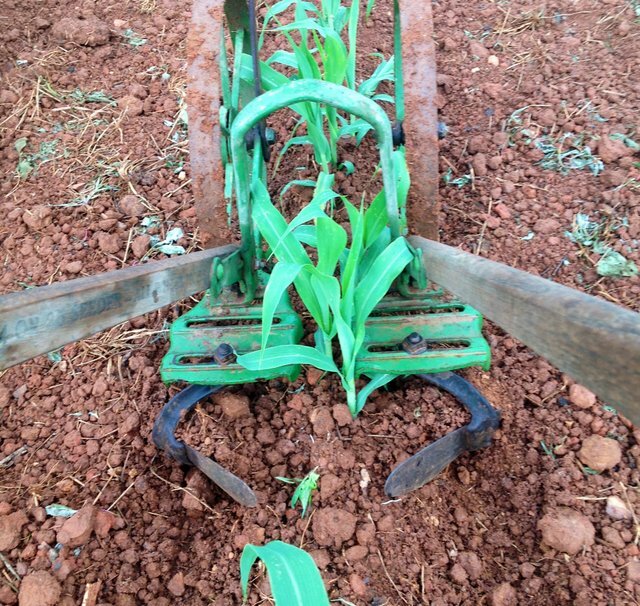 This allows for better root development making for better plant stability. A closer look at the plow attachments. 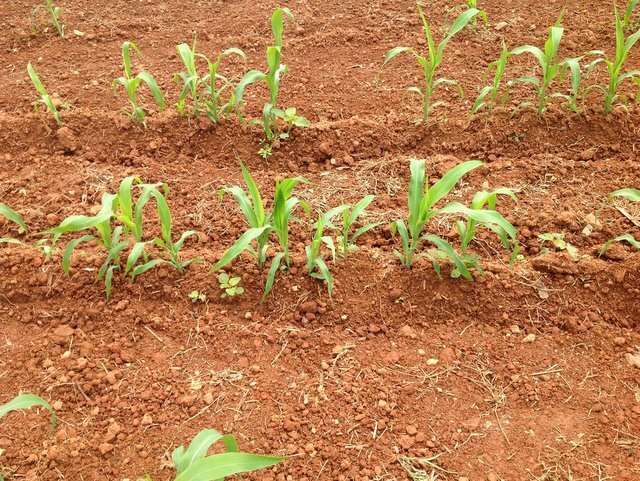 Also notice the cultivators arched frame that passes over the young plants. Later hilling is done from each side using a different tool. 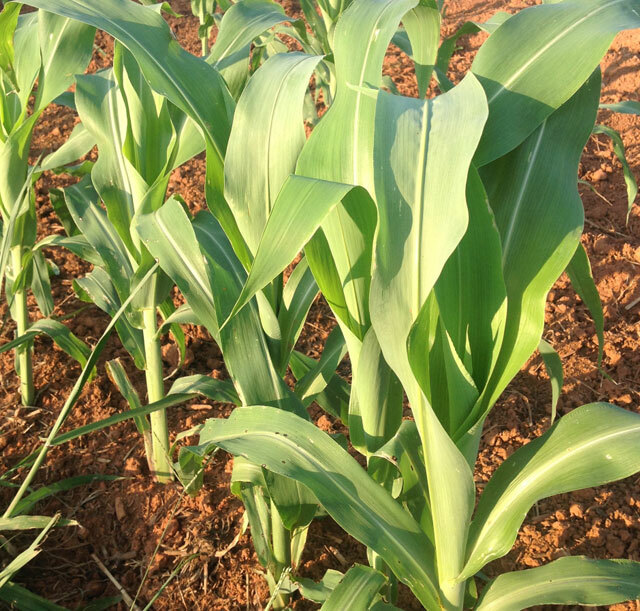 Big, broad leaves; same as Ear, or Indian corn. 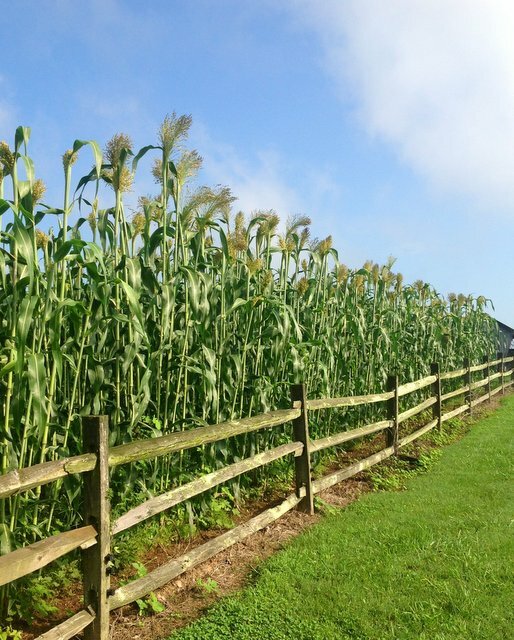 Plants are now as tall, or taller, than the fence. 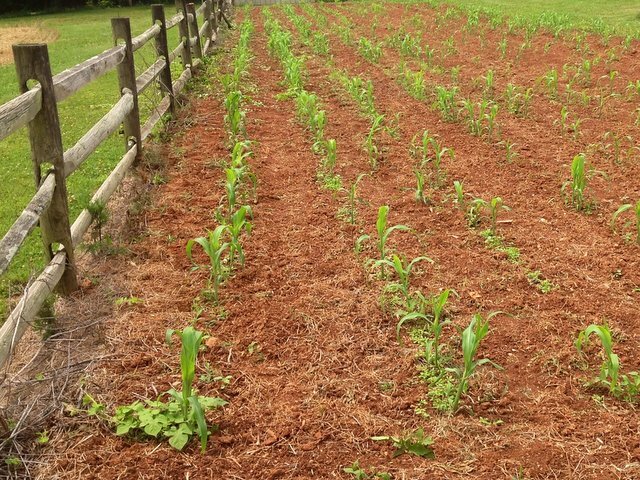 Now with planting, cultivating and hilling of the Broomcorn finished it's "lay-by" season. Plants are tall and large enough to shade out weeds. Now we leave the plants to their business of growing and wait for harvest time. 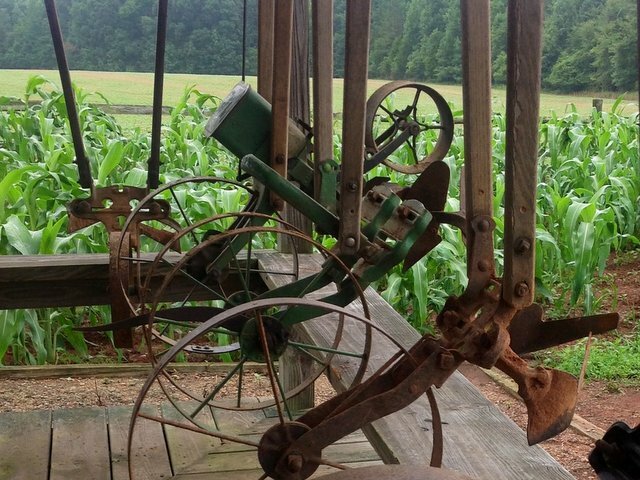 Tools are temporarily put away until the fall garden is put in. Same location, looking at garden shed; only roof is visible. Plants are now six to seven feet in height; no more fence viewing from this direction. Lots of "Brush" tops in view. The brush emerging from several plants at varying stages of maturity. Beautiful ornamental plant as well. 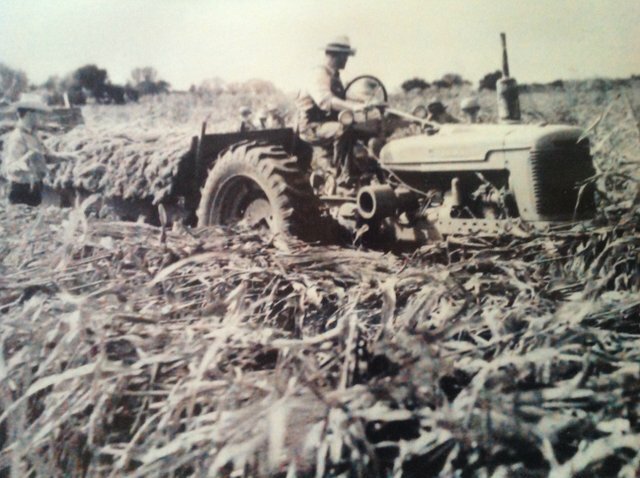 The next four pictures were taken in the 1940's and illustrate the broomcorn harvesting process. 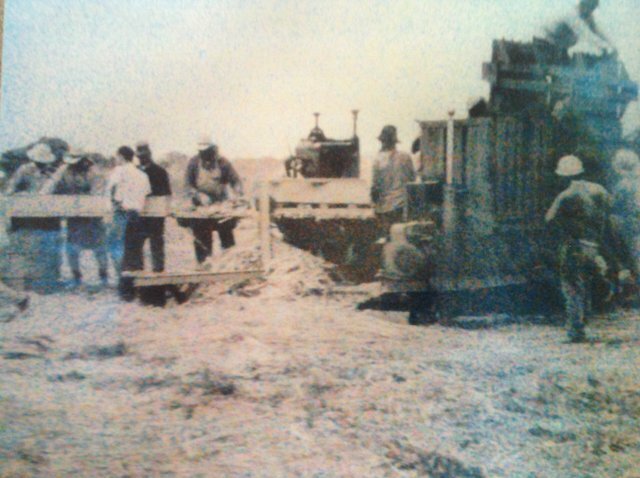 The harvesting begins with a process called "Tabling". The plants of two rows are bent over, toward each other forming what is called a "Table". 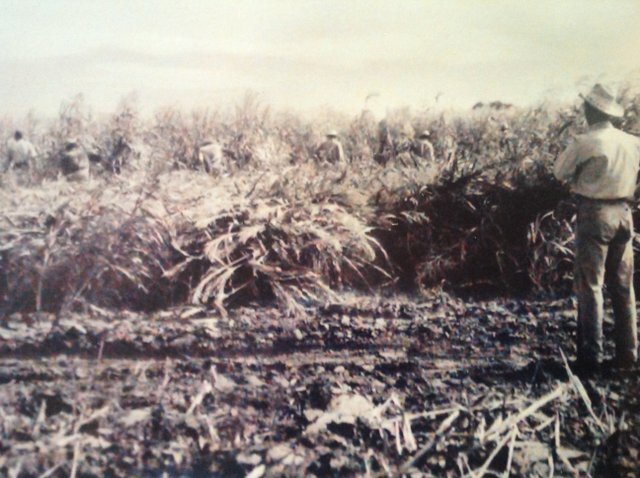 Workers move through the field row after row "tabling". The broomcorn is cut and loaded on wagons to be taken to the thrasher. 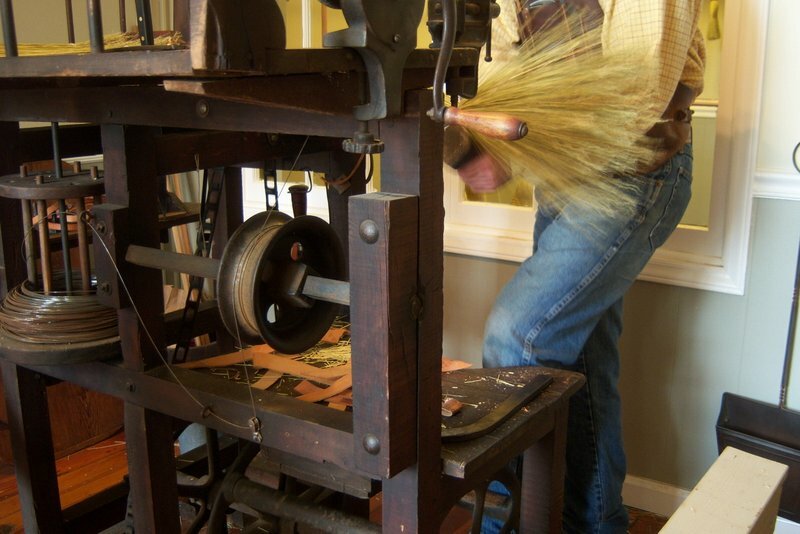 The seedhead, or Brush, is stripped of seeds during the thrashing process. 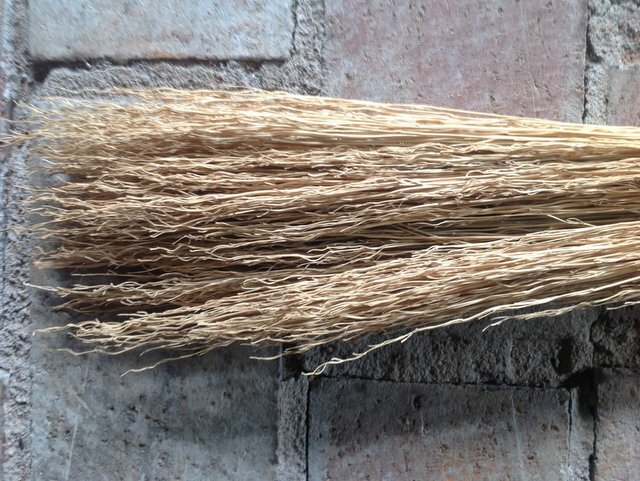 After processing and going through a length sizing machine, the broomcorn is baled into like sized length from 12 to 22 inches. This is the way they arrive at the shop. Pictured here are two, each weighing approximately 125 lbs. The bales are made up of approximately twenty smaller five pound bundles. The steps of the binding procedure. ...or prop it upside down. 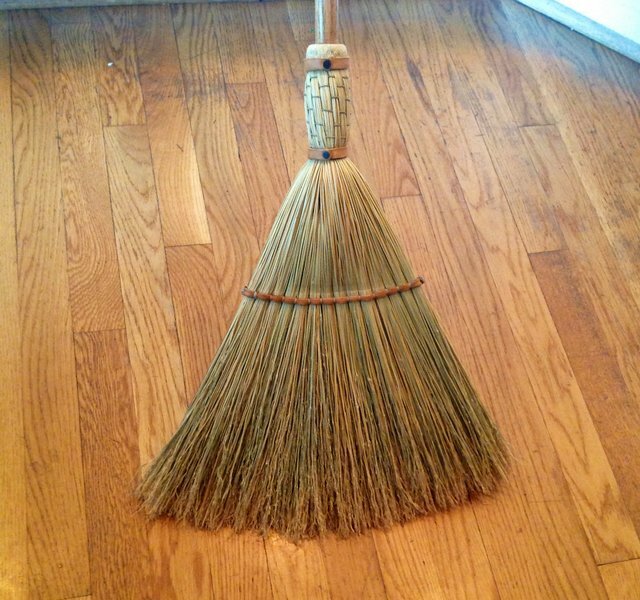 The sweeping end of your broom should only touch the floor when engaged in sweeping. When the broom is temporarily set aside during interruptions while sweeping, refrain from resting the broom on its brush end. Prop the broom up with the handle resting upon the floor, or lay horizontally across something if hanging it up is not possible. When storing your broom, hang it up on a hook. 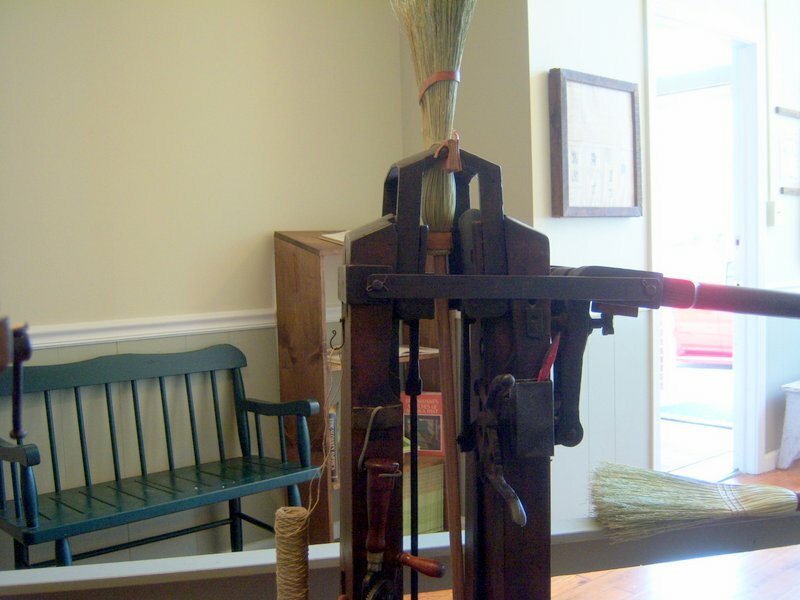 This prevents the broomcorn from bending. When sweeping, occasionally alternate the side of the broom you are using to sweep. 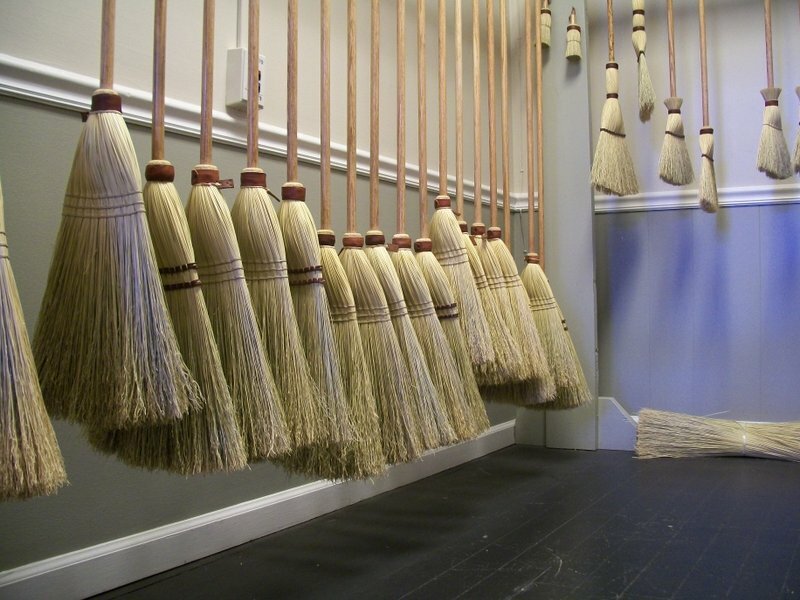 This makes for equal wear of both sides of the broom.